Chroma Lab: We’re Alicia Cornwell and Tony Bevilacqua, aka Chroma Lab. 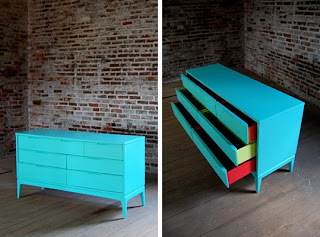 We live in Jamaica Plain and spend most of our time restoring and redesigning furniture with bright colors. Alicia is a native Texan, and Tony is a native Bostonian. Chroma Lab: Alicia is an art historian and Tony is a fine artist and decorative painter. Both of us went to art school. Everything you’ve heard about art school is true, but we really liked it anyway. Chroma Lab: We spend a lot of time thinking about eating, preparing to eat, and then actually eating. We love running with our whippet/collie dog Cassie and playing with our two tortie cats Sophie and Maddie. Other than that, Alicia likes to read biographies of British aristocrats (sometimes French), and Tony likes woodworking (a lot). Chroma Lab: Tony remembers trying to draw Garfield as well as his friend did. Now he totally can. BH: What's your favorite color? Chroma Lab: ALL of them! We could never be forced to pick just one. In fact, we refuse. Chroma Lab: Alicia’s favorite is a reproduction of a Ucello portrait from the Gardner Museum that Tony painted for her. Tony’s favorite is a bench and table that was handmade by his great grandfather. Chroma Lab: We find interesting furniture that needs help in the looks department, then we restore it and paint it with bright colors and specialty finishes. 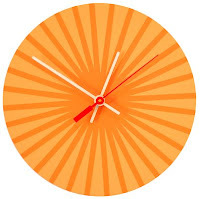 We also make and paint clocks, and we’re working on a new line of lamps. We do everything by hand as opposed to robotics, which would take a lot more time to figure out, quite frankly. Chroma Lab: It’s really exciting to turn something around completely and give it a new lease on life, and it’s better for the environment to reuse things and make them last longer, too. Plus we can always use furniture, so it’s fun to keep things for our own house. Sometimes it’s a little too fun to do that. Chroma Lab: We exhibited at the Interior Design Show Toronto in February. The show was great, but it took 14 hours to drive each way to and from Boston with a clunking trailer full of furniture and supplies. It sounds more glamorous than it was. Chroma Lab: When you buy a handmade item, you’re supporting someone’s livelihood and creativity, and the money stays in your community. Besides, handmade things are usually amazing and unique. It’s the way things were done in the past, and we’re telling you, they were onto something. BH: What are your favorite books, movies, music, and ways to waste time on the internet? Chroma Lab: We both love reading Harry Potter, watching 30Rock, and listening to Talking Heads. Also, have you read Me Write Book: It Bigfoot Memoir by Graham Roumieu? Gut-busting. Chroma Lab: Alicia’s great great great aunt Anna Jarvis began the tradition of Mother’s Day in the US. She is also a human jukebox. Tony does not play basketball. When you meet him, you will see why this is surprising. Chroma Lab: Hopefully in a studio with more natural light. That's all we really ask. Loved your interview! Your comment about art school made me laugh---so true! The portrait by Ucello is wonderful. Thank you for sharing this about yourselves! Great interview...can't wait to meet you both in person, and see your gorgeous work, probably at SoWa this spring or summer.